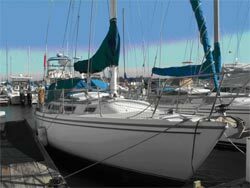 34' Catalina sailboat | Christian & Co.
components appear satisfactory. Waste system and components appear satisfactory. General service seawater systems appear satisfactory. Engines external surfaces appear good and exhibit no significant rust, oil or coolant leaks. Engine hour meters exhibit 147 hours. Motor mounts appear good. Cooling systems appear good but there are signs of the raw water pump starting to leak. Fuel systems and components appear good. Exhaust systems and components appear satisfactory – good. Electrical systems and components appear satisfactory. Engine control systems appear good and shaft log appears good. Steering control systems appear good and rudder port appears satisfactory (minimally accessed). Propulsion components were not inspected externally. Waste systems and components appear satisfactory but the head system is not equipped with anti-siphon valves. General service seawater systems appear satisfactory but below waterline hose connections are not double clamped. and return lines and components appear satisfactory. outlets appear satisfactory. The AC main feed are protected with circuit breakers. system appears satisfactory. Wire terminations and connections appear satisfactory. Wire organization and arrangement appears satisfactory. 406 MHz EPIRB (2008 battery), canister airhorn, ship’s bell. and feed lines appear satisfactory. suitable for its intended purpose as a near coastal cruising vessel. extinguishers in 6 year intervals. 2. Provide federally required, approved and current distress signal flares. 4. Service and prove the bilge pump functional in the automatic mode. 6. There are wires connected directly to the battery which are smaller than normal. Determine their purpose, increase size as necessary to eliminate any liabilities. Comply with A.B.Y.C. (or similar) standards. 1. Several of the windows are cracked, one is in the process of being replaced. Replace cracked windows as necessary. paint to allow detection of any future weeps or leaks.